Your business can now reach thousands of discerning wine-loving travelers to this site as they plan their visit to the growing number of Yadkin Valley wineries and vineyards. Visitors to the wineries on the Yadkin Valley Wine Trail ® are seeking dining, lodging, shopping, cultural and recreation venues to enhance their visit to "The Heart of North Carolina Wine Country." Let them know you are here and want their business. Winery tourism is one of the few areas that continues to expand - now you be a part of it! If you are a business located in or immediately adjacent to the Yadkin Valley, you have a unique opportunity to reach out to visitors coming to the area for winery visits. Our Yadkin Valley Wine Trail ® site caters specifically to the winery visitor. North Carolina is a state with a higher percentage of visitors arriving by auto than many other states along the east coast of the USA. There are over 10 million potential visitors within an eight hour drive.. Winery visitors have a higher average income than many other tourists. They are looking for a total experience when they visit Yadkin Valley wineries and vineyards. They are more likely to stay in bed and breakfasts and more likely to dine at upscale establishments. They have the disposable income for purchases such as antiques, art, and jewelry, and many are looking for recreational activities to supplement an extended stay. They tend to "tread lightly" on the local infrastructure. Your business can now capitalize on the opportunity to have them as *your* customers! With well over two dozen operating wineries and vineyards along the Yadkin Valley Wine Trail ® open to the public for winery or vineyard tours, tasting and sales, you can join the growing number of astute business owners who want to connect with these visitors. See below for additional information and advertising opportunities! Why why should you consider our website as one tool in your advertising arsenal? 6) In 2012, we hope to release our brand new Yadkin Valley Wine Trail ® Official Passport, with discounts in excess of $300 for visitors who purchase them at wineries and other select locations. This includes reduced tasting fees, discounts on post-tasting purchases, discounts on multiple nights lodging, discounts on beverages or desserts when entrees are purchased, and other savings to encourage winery tourists to visit *your* business. Try it yourself - Imagine you are a winery tourist seeking information for a visit to the Yadkin Valley wineries. Search Google for the term 'wineries in the yadkin valley' or the term 'yadkin valley wineries.' Yadkin Valley Wine Trail ® has continually been listed at or very near the top of the first results page. Once visitors land on our Yadkin Valley Wine Trail ® site, they are easily able to locate your business and visit your home page. Visitors to our Yadkin Valley Wine Trail ® website have clicked through to our Subscribed businesses over 66,000 times (on an annualized) basis through May 2012! A click-through is a conscious and positive action taken by a visitor to visit a local business website which has a Subscribed Enhanced Listing with us. While a visitor who clicks on a Subscribed client's website does not guarantee a sale, it *does* indicate they had an express interest in finding out more about the business. With your Subscribed Enhanced Listing, we redirect them to *your* website where *you* can sell them on *your* particular service. Your presence on our Yadkin Valley Wine Trail ® maps and brochures makes you stand out from the crowd of non-Subscribing businesses. See below for comments from current advertisers on out site. We challenge you to find a more effective bang for your advertising buck anywhere! 3) Eighty percent of responding visitors surveyed had annual household incomes of at least $50,000; fifty-eight percent had household incomes in excess of $75,000; thirty-seven percent in excess of $100,000; fifteen percent in excess of $125,000; thirteen percent in excess of $150,000; and nine percent had household incomes in excess of $175,000 per year. 5) Fifty-five percent were North Carolina residents, followed by 7.5% from South Carolina, 6.2% from Florida, 3% from Virginia, 2% each from Pennsylvania, New Jersey, Ohio and Tennessee, and one percent each from Georgia, Washington and Michigan. Six respondents from outside the USA (Canada, the United Kingdom, India and Italy). Of the North Carolina residents, 52 percent were new visitors and 48 percent were repeat to the winery where the survey was distributed. 8) Activities linked with the respondents winery visits included sightseeing, fine dining, shopping, outdoor recreation, historical sites, entertainment, parks, museums and sporting events;. NOTE: To see the full study published by ASU, click here. The study will be displayed in a new browser window. When finished, close that browser window to be returned to this page. You will need Adobe Acrobat Reader to view the ASU publication, which is maintained on the NC Department of Commerce web-site. Yadkin Valley Businesses - Here Is Your Opportunity To Reach These Winery Visitors! 1) Add your business listing to the Yadkin Valley Wine Trail ® site now. With a Subscribed Enhanced Listing, your business name, address and phone number, along with a hyperlink to your home page listed on this site. That same information, plus geo-coordinates, will also be placed on our Google map to assist visitors in finding your business. 2) Your Subscribed Listing entitles you to be included in our Yadkin Valley Wine Trail ® printed map/brochure. You will receive a supply of Yadkin Valley Wine Trail ® printed maps/brochures to pass out to visitors to your business. Other participating businesses will also receive a supply of map/brochures, so you will receive the benefits of pooled advertising to reach the maximum number of wine-loving visitors at a minimal cost. Brochures will also be placed at area Visitor Centers, Chambers of Commerce, and Convention Centers. The initial run was 10,00 maps and brochures. 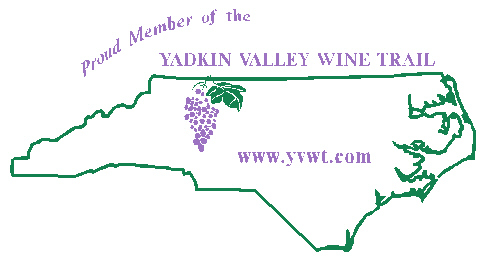 They will be updated on a regular basis as new participating businesses join the Yadkin Valley Wine Trail ® . Each business will be provided with a Yadkin Valley Wine Trail ® window decal (see below) which you may display in your business. You will also be licensed for the annual period to use the trademarked term "Yadkin Valley Wine Trail ®" for advertising your business as you deem appropriate. The brochure will ultimately be available online to site visitors so they may print a copy in advance of their trip to the Yadkin Valley Wine Trail ®. If you would like more information about promoting your business along the Yadkin Valley Wine Trail ®, click here and a pre-addressed e-mail message will appear. Your privacy will be respected, and your e-mail address will not be sold, bartered, or traded. Thank you for your interest!